This 2013 GMC Acadia Denali AWD - CARFAX Certified 1 Owner - No Accidents - Fully Serviced - Quality Certified W/up to 10 Years, 100,000 miles Warranty This GMC includes: BOSE AUDIO SYSTEM, COLOR TOUCH NAVIGATION AM/FM/SIRIUSXM/HD RADIO WITH CD/DVD PLAYER HD Radio Navigation System CD Player AM/FM Stereo Satellite Radio Bluetooth Connection Auxiliary Audio Input MP3 Player TRANSMISSION, 6-SPEED AUTOMATIC (STD) A/T 6-Speed A/T REAR SEAT ENTERTAINMENT SYSTEM Entertainment System AUDIO SYSTEM FEATURE, BOSE ADVANCED 10-SPEAKER SYSTEM Premium Sound System RECLINING FRONT BUCKETS (STD) Bucket Seats SEATING, 7-PASSENGER 3rd Row Seat Rear Bucket Seats Bucket Seats WHEELS, 20 Chrome Wheels *Note - For third party subscriptions or services, please contact the dealer for more information. * The GMC Acadia Denali AWD - CARFAX Certified 1 Owner - No Accidents - Fully Serviced - Quality Certified W/up to 10 Years, 100,000 miles Warranty offers a fair amount of utility thanks to its advanced features and unique styling. It's also quite sporty, and injects an ample amount of handling chutzpah into the ridin'-high body of a family-friendly SUV. Is it possible to fall in love with a vehicle? It is when your vehicle is as prestige as the GMC Acadia. Savor the satisfaction of safety in any condition with this AWD GMC Acadia. Superior acceleration, unmatched traction and stability as well as a luxurious interior round out the impressive features of this AWD GMC Acadia. In addition to being well-cared for, this GMC Acadia has very low mileage making it a rare find. The entertainment package featured in this vehicle will easily provide an memorable experience every time you ride in the GMC Acadia Denali AWD - CARFAX Certified 1 Owner - No Accidents - Fully Serviced - Quality Certified W/up to 10 Years, 100,000 miles Warranty. You may ask yourself how you ever lived without an entertainment package. Added comfort with contemporary style is the leather interior to heighten the quality and craftsmanship for the GMC Acadia This GMC Acadia offers the most up-to-date navigation system available so you'll always know the most efficient route to where you are going. With all records included, drive away confidently knowing the complete history of this GMC Acadia Denali AWD - CARFAX Certified 1 Owner - No Accidents - Fully Serviced - Quality Certified W/up to 10 Years, 100,000 miles Warranty. This gently driven vehicle has been well-kept and still has the showroom shine. High performance is what this vehicle is all about. You will be reminded of that every time you drive it. This impeccably built GMC Acadia Denali AWD - CARFAX Certified 1 Owner - No Accidents - Fully Serviced - Quality Certified W/up to 10 Years, 100,000 miles Warranty comes with a plethora of added features that have made this vehicle a unique find. These options will simply amplify the experience of owning and driving this wonderfully crafted GMC. Finding a pre-owned vehicle with flawless paint is a rare find, but you've done just that. The paint on this GMC Acadia Denali AWD - CARFAX Certified 1 Owner - No Accidents - Fully Serviced - Quality Certified W/up to 10 Years, 100,000 miles Warranty is flawless no scratches, no blemishes, no need to spend extra money on touch ups. This extraordinary find is a once-in-a-lifetime opportunity for someone who understands automotive magic. Equipped with upgraded wheels, this GMC Acadia is stunning to see driving down the street. More information about the 2013 GMC Acadia: The GMC Acadia full-size crossover offers an excellent minivan alternative to families looking for a safe, stylish, people carrier. Available all-wheel drive means that weather won't prevent the occasional side trip, either. When stacked against competitors like the Dodge Durango, Honda Pilot or Toyota Highlander, the Acadia more than holds its own, with several unique standard features. 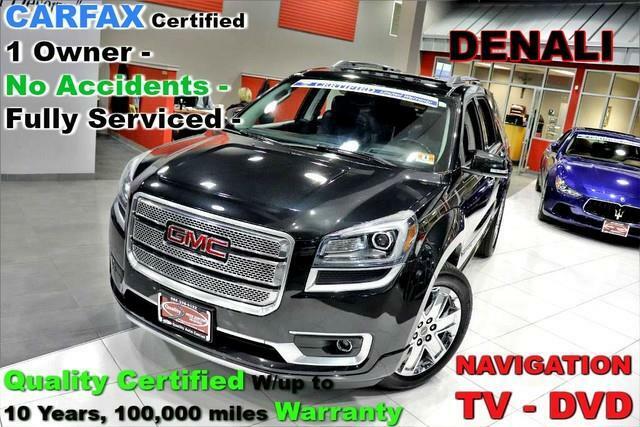 Interesting features of this model are luxury Denali model, attractive styling, available all-wheel drive, lots of cargo space, Room for eight passengers, able handling, and ample standard features No Credit / Bad Credit / No Paystubs, No problem !! ! All Approved ! Everyone drives ! CLEAN, GORGEOUS, LOW MILES, SHOWROOM CONDITION. CALL NOW QUALITY CERTIFIED up to 10 YEARS 100,000 MILE WARRANTY , To Certify a vehicle, there will be an additional cost for Certification. CALL NOW For details. STUNNING AGGRESSIVE LOOK ON THIS BEAUTIFUL--Call today to schedule a test drive... Good Credit/Bad Credit/No problem!!!! Get paid cash? No problem!! 100% Credit Approval with interest rates starting at 2.49% for qualified customers, our rates will not be beaten. We price our cars at wholesale price to guarantee the best deals for our customers. Our inventory moves quick, please call to confirm the availability of the vehicle of your interest Springfield location 973-564-0112. This vehicle is located at our SPRINGFIELD location. Come visit our new showroom in Springfield NJ. Quality Auto Center is honored to present a wonderful example of pure vehicle design... this 2013 GMC Acadia Denali AWD - CARFAX Certified 1 Owner - No Accidents - Fully Serviced - Quality Certified W/up to 10 Years, 100,000 miles Warranty only has 73,336mi on it and could potentially be the vehicle of your dreams! Gone are the days of SUVs being the size of a tank and handling like one. This GMC Acadia is a perfect example of how SUVs have evolved into vehicles that are as refined as they are rugged. The GMC Acadia Denali AWD - CARFAX Certified 1 Owner - No Accidents - Fully Serviced - Quality Certified W/up to 10 Years, 100,000 miles Warranty's pristine good looks were combined with the GMC high standard of excellence in order to make this a unique find. This vehicle has an added performance bonus: AWD. It improves handling on those winding back roads, and gives you added safety and control when driving through wet and snow weather conditions. This vehicle has extremely low mileage on the odometer, so while it's pre-owned, it's practically new. Marked by excellent quality and features with unmistakable refined leather interior that added value and class to the GMC Acadia More information about the 2013 GMC Acadia: The GMC Acadia full-size crossover offers an excellent minivan alternative to families looking for a safe, stylish, people carrier. Available all-wheel drive means that weather won't prevent the occasional side trip, either. When stacked against competitors like the Dodge Durango, Honda Pilot or Toyota Highlander, the Acadia more than holds its own, with several unique standard features. This model sets itself apart with luxury Denali model, attractive styling, available all-wheel drive, lots of cargo space, Room for eight passengers, able handling, and ample standard features No Credit / Bad Credit / No Paystubs, No problem !! ! All Approved ! Everyone drives ! CLEAN, GORGEOUS, LOW MILES, SHOWROOM CONDITION. CALL NOW QUALITY CERTIFIED up to 10 YEARS 100,000 MILE WARRANTY , To Certify a vehicle, there will be an additional cost for Certification. CALL NOW For details. STUNNING AGGRESSIVE LOOK ON THIS BEAUTIFUL--Call today to schedule a test drive... Good Credit/Bad Credit/No problem!!!! Get paid cash? No problem!! 100% Credit Approval with interest rates starting at 2.49% for qualified customers, our rates will not be beaten. We price our cars at wholesale price to guarantee the best deals for our customers. Our inventory moves quick, please call to confirm the availability of the vehicle of your interest Springfield location 973-564-0112. This vehicle is located at our SPRINGFIELD location. Come visit our new showroom in Springfield NJ.